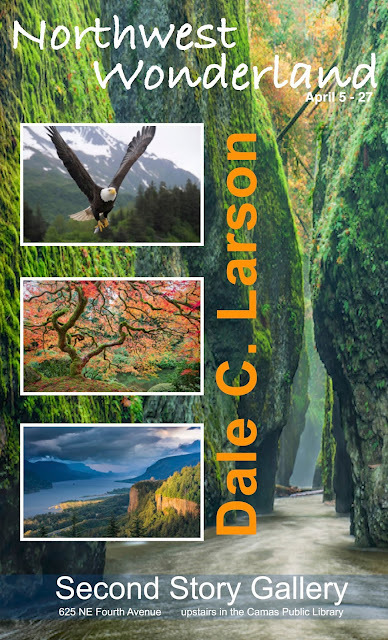 Camas photographer Dale C. Larson brings his outdoor scenes on metal plates to Second Story Gallery in April. He will be on hand to discuss his style of shooting at a reception Friday, April 5, from 5 to 8 p.m. in the gallery, upstairs in the Camas Public Library. For his ﬁrst formal exhibit, Larson has chosen to focus only on pictures he’s taken in Washington, Oregon and Alaska. “Northwest Wonderland” is a show of stunning plates, many oversized, ranging from bears and eagles on ﬁshing expeditions to the simplicity of a single Japanese maple. Mount Rainier is represented, as well as Oneonta Gorge. He’s sticking close to home in this hometown show, but Larson calls himself fortunate to have also photographed scenery on several continents before retirement. He began by focusing his camera on wildlife, he says, but has gravitated toward scenic landscapes to preserve his travels. The April 5 unveiling, part of the Downtown Camas First Friday event, will also feature live music by Rob Lewis. The photography show will remain on display through April 27 during regular library hours. One of the largest groups in Second Story Gallery’s history will be offering work “From the Heart” during February and March. The Southwest Washington Watercolor Society will send 24 members to fill the walls of the gallery, located upstairs in the Camas Public Library. 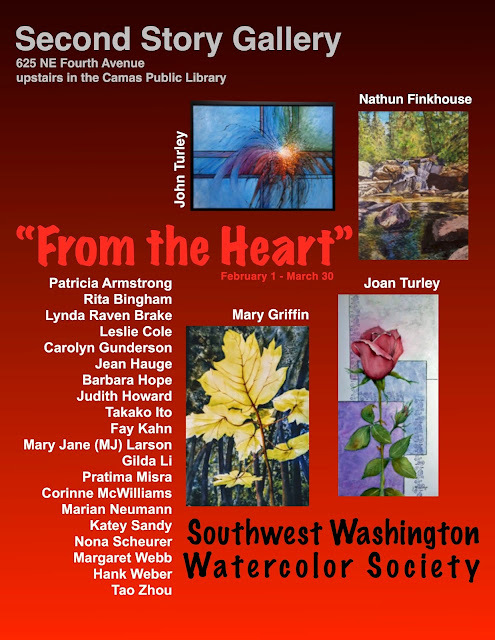 The opening reception is Feb. 1 from 5 to 8 p.m. It will offer a chance to meet all the artists as well as music by Brad Jensen and chocolate refreshments, part of the downtown First Friday celebration. The show will continue through March during regular library hours, 10 a.m. to 8 p.m. Monday through Wednesday, 10 a.m. to 6 p.m. Thursday through Saturday in the library. That's a lot of art . . . come see what they've produced for their show called "From the Heart."